New Delhi: From the time he was dating actress Anushka Sharma to his wedding in Italy and even now — months after the two tied the knot — prying paparazzi and public scrutiny of Virat Kohli’s life has not stopped. India’s cricket captain and the icon of the country’s youth says it can get uncomfortable, but the Royal Challengers Bangalore skipper is learning to deal with it. 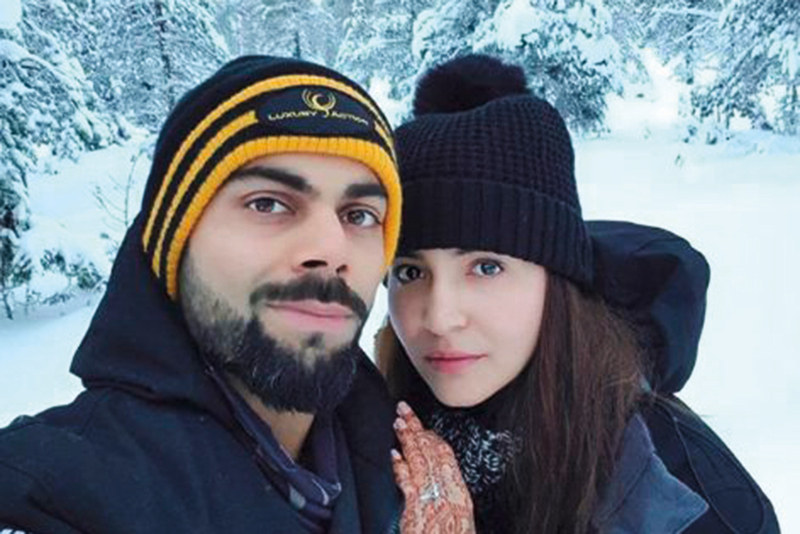 Virat and Anushka, fondly called ‘Virushka’ by their fans, dated for four years before tying the knot in an intimate affair in Tuscany last December. With celebrity status comes the baggage of being under the scanner all the time. Does he find it easy? “The constant public scrutiny about my personal life can become a bit uncomfortable at times. However, I have learnt how to handle it. Celebrities are also normal human beings — just like any other person, and I feel people should let them have their space,” Kohli told IANS in an email interview. The 29-year-old, who endorses multiple brands including Puma, says he keeps a good balance between his personal and professional lives despite his chock-a-block schedules. “I keep a good balance between my personal and professional life. When I am with family, I try to completely switch off from cricket. I try to catch up with friends, watch a movie or go out for a drive,” he said. However, he said when he is on a tour, he puts his “mind and heart into the next game”. “It includes regular training for fitness and skills,” added the Delhi boy, who represented the city’s cricket team at several age-group levels before making his India team debut in 2006. On his journey from domestic cricket to becoming India captain, Kohli said: “It has been an incredible journey. I come from a humble background, and my journey towards where I am today started from a colony in West Delhi. Kohli, who made his ODI debut for India against Sri Lanka at the age of 19, asserted that it was always his dream to represent India. “From the very first day, my goal has been to play for my country, and this brings me immense pride. Standing on the cricket pitch, and seeing your countrymen cheer for you, is a happy feeling, and I enjoy every moment of it,” said the India team skipper, who also won the Arjuna Award in 2013.